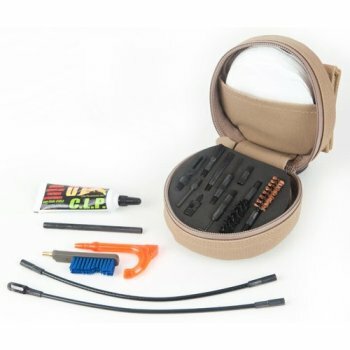 This cleaning system is specifically designed to clean and maintain M9 9MM pistols and sub guns. Now automatics can be cleaned correctly, from Breech-to-Muzzle®, without dis-assembly. Memory-Flex® cleaning rods, panoply patches and a heavy-duty bore brush easily strip the copper from bores. Special handle with scraper, pick and brushes clean the receiver, trigger group and bolt. A comprehensive instruction booklet is included to help maintain flawless performance in mission critical situations. Everything is packed neatly in a 7 oz. pocket size, coyote tan, soft-pack, zipper closed case.